January 29, 2018, was a bittersweet night for me. 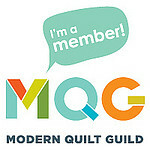 After 29 months, my presidency of the Valley Modern Quilt Guild came to an end. It has been an incredible learning experience for me, as well as many of the other board members. I will now have more time to dedicate to the things that I’d like to be working on rather than the things that I have to get done. During the meeting, my guild members presented me with this gorgeous quilt and I absolutely love it. It was pieced by the members and quilted by Lois Christianson. Wow! You must have been a great President!